I dont plan to sale server, maybe later it will be available for customers (like in Rust), not sure. el servidor está apagado en este momento. Antes do lançamento da primeira versão de um único jogo algumas semanas, penso. Hi, the people on the floor are offline players. When you disconnect - you also will do nothing on the floor :) and by the way, anyone else may kill you, so, logoff in safe place. If you gather resources with bare hands (without tool) near the townhall - you will get 100% tax (at the moment, but later i'll tune the taxing system), so, move away from that place. It's a 700m radius of taxing now (about 2-3 min to walk). Yes, i have plan to decrease it to 500m. If you walk long time and still are taxed - probably you got in taxing area of another townhall. Stones on the north-west, big mountains in the center, the sun on the east. A little shift with plans, i planned a little redevelop a game and it will be a large builds. So, build 6 is just a little fix, not large survival build as planned before. Sorry for that. Thank you for report and suggestion. You can't gather wood (notify: +0 wood) because somebody built townhall near and gathering tax. Townhall has 700m radius taxing area. I will add tax info to notify window in next build. About sprint: there is a huge world in the game, it's not "arena" - traveling and gathering different resources must not be a quick and easy. More crafting stuff available in wooden workbench. More stuff will be in next builds (see roadmap). Roadmap for pre-alpha stage of development. 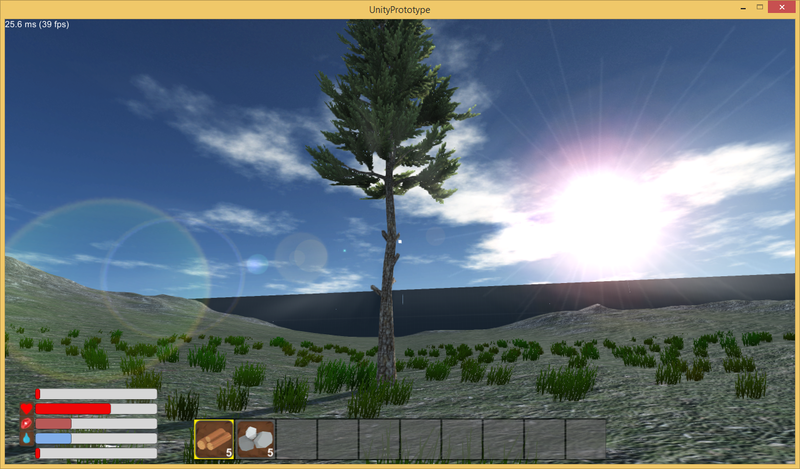 Build 7 (v0.0.7) is about survival. Planned things: animal (removing hunting cell), day/night system, torch, temperature status, campfire (for cooking and keep warm). 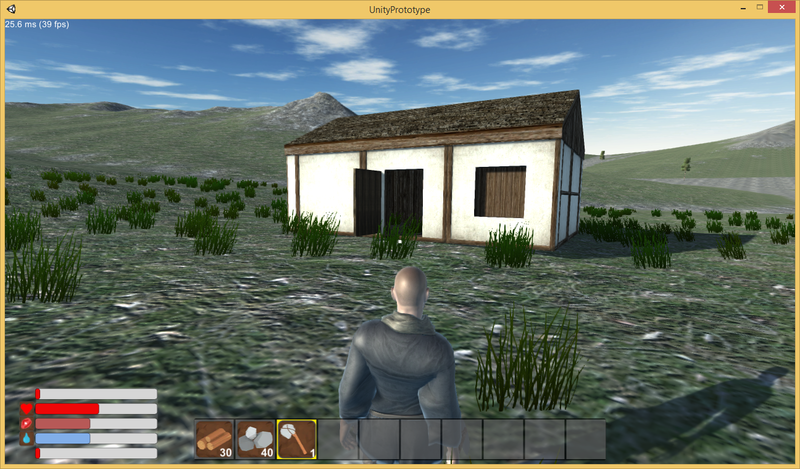 Build 8 (v0.0.8) is about towns. Planned things: walls, gate, market (players trading), battering ram. Build 9 (v0.0.9) is about war. Planned things: weapons, armors, clans. Build 10 (v0.1.0) is a first early-alpha build, it's a reporting build (fixes, etc). Yes, i do, but logs are not so detailed at the moment. Checked eating/drinking - it works. You have 52 water in 3 slot and 138 meat in 4 slot. Sun is always on East (till i'll add day/night). Big mountains are in center. Stones are on North-West. I'll add map picture in next builds. Yep, i forget to include these animations :)) will be added later. Ok, i'll see what can do. Yep, it's multiplayer since the beginning. But online is low at the moment (the high i've seen was 2). No, the map is one. No, i dont have such plans exactly. Male/female option will be later. Attributes are big question, because i want exclude "leveling" characters for fast integration new players to the game. Hm, build 3 was uploaded for all 3 platforms. Did you download Medieval-Towns-b3-x64.app.zip? And what build version in main menu? Thank you for your feedback, it really helped me locate bugs and helps me make game better! About workbench: sorry, my mistake - i changed build on server, but didn't check old game client. I uploaded build 2 (must fixed this). About stack: strange, but it must work. About food and drink: you have to build hunting cell (generates meat) and water collector (generates water), it's available in workbench. Later i'll change survival system: add animals, etc. If player body in horizontal position - it's player in logoff, you may kill him and get his loot. AI will be later, but it will be not possible to play without internet, because multiplayer is one of main game features... at the moment. The online game about survival, building of towns and war. The game in a deep development process now.